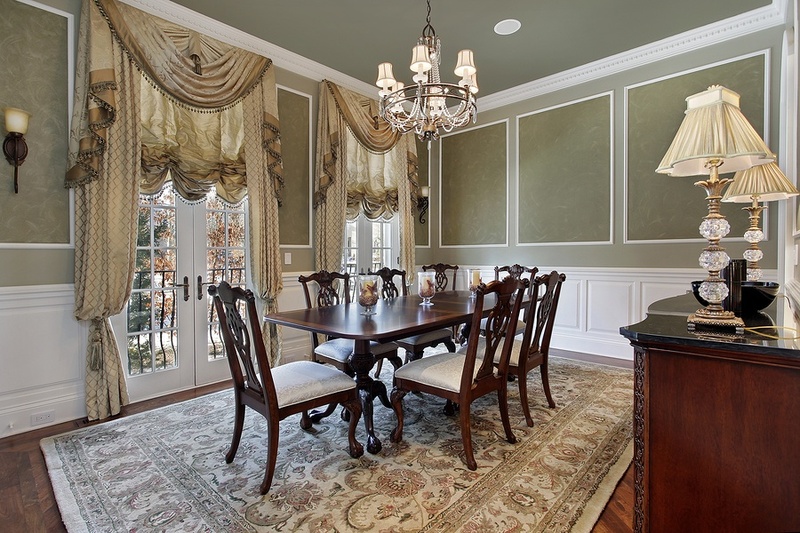 Your dining room sets the stage for great meals, conversations and celebrations. How you decorate and illuminate this space helps to determine the comfort and tine of the room. Regardless of which wall color, furnishings or floor coverings you choose, your lighting is the primary factor that affects the mood and ambiance of the room. Opt for a combination of natural and artificial sources for the best results and maximum versatility and control. Measure the length and width of your room. Round the numbers up or down to achieve a whole number, in feet. Add the length and width together (example: If your dining room is 12 feet wide and 14 feet long, the number will be 26). Choose a lighting fixture approximately 26 inches in diameter. Consider the size and shape of your table as well, ensuring the fixture doesn't extend past the table. Otherwise, guests may feel uncomfortable or hit their heads when rising. A single source of light is rarely adequate for any room, and in the dining room, it's especially important to provide various layers of light to create the perfect atmosphere. In addition to the central ceiling fixture, natural lighting and/or wall fixtures (which provide ambient lighting for the entire room), accent lighting can help to highlight key features such as artwork or furniture. Dimmer switches and window shades can help to further control the amount of light in the room. As a general rule, the main ceiling fixture should be centered over the dining room table and hung at a height between 28 to 36 inches from the top of the table. Recessed fixtures and wall sconces should be installed in relation to elements such as artwork, doorways and other sources of light. Windows are a great source of ambient lighting in your dining space. Window shades from Polar Shades are available in a wide variety of colors, fabrics and patterns to suit every taste, and allow you to control the intensity and volume of light with the touch of a button. Natural, filtered light is the perfect design element, keeping out unwanted heat and glare, protecting artwork, furnishings and flooring from harmful UV rays and providing guests with an unobstructed view to the outdoors. Contact the Polar Shades professionals at 877-260-6110 for expert advice, products and services. Don’t forget to download our free Shades vs Blinds guide and let us help you choose the perfect window coverings for your dining room – and every room in your home.